March 21st- A DIFFERENT “EARTH” HERE TODAY! 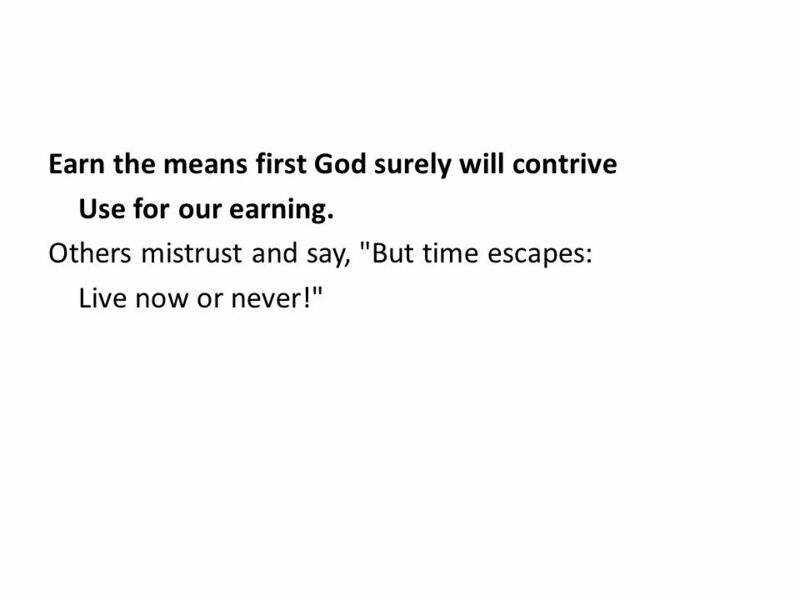 The line I like most as it has given me the vision for life. ” AIM HIGH, ACHIEVE HIGH” I used this thousands of time to motivate all! 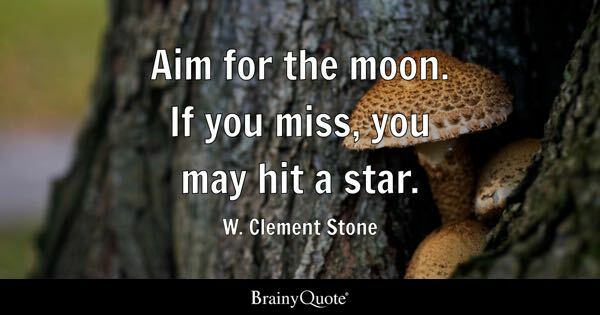 ‘Aiming high and missing’ better than ‘aiming low and achieving’-joy unbound! LITERARY DOYEN IN GOD’S COMPANY. India that is Bharath my motherland indeed is a holy land that has produced men of great literary caliber and one such was DEV BHARADWAJ of Chandigar . 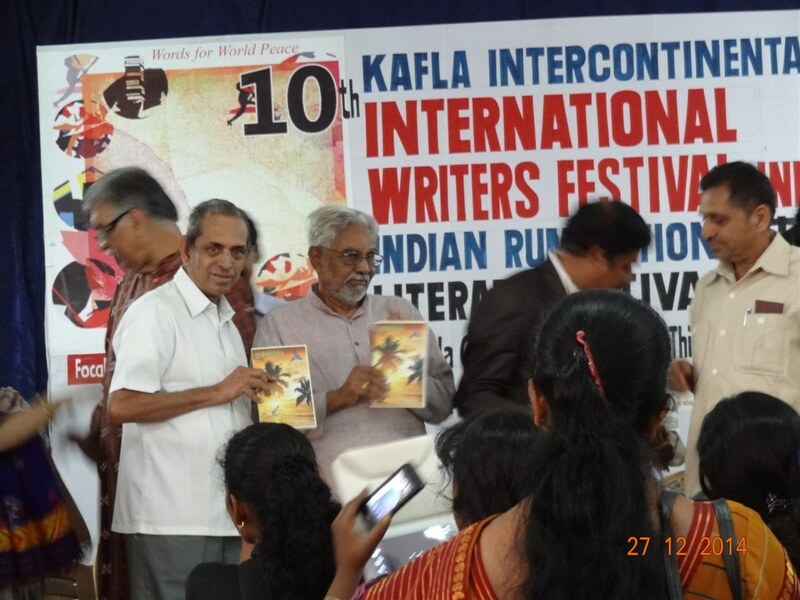 Shri DEv Bharadwaj-Editor of KAFLA INTERCONTINENTAL who organized 10th International Festival of Poets, Writers, and Scholars in Trivandrum on 27th and 28th December 2014 at Gandhi Bhavan Thiruvananthapuram which I attended and presented my poem on International Peace and my 3 and a half page report on the Festival was published in the KICSummer Issue 2015. He at the age of 70 passed away on 10th and funeral is taking place today at Chandigarh. May his soul rest in peace. My books GIFT OF LIFE and my translation of Daisaku Ikeda’s poems to Tamil were released and I presented my paper on TRANSLATION LITERATUR. On return I prepared a Report on the Festival and the same was published in his prestigious magazine which is reproduced here for the benefit of rereading of thye same on tis sad occasion. It was indeed a great delight to receive the letter dated 19th October 2014 from Shri Dev Bhardwaj, Director, India Inter –continental Cultural Association, Chandigarh, inviting me to participate in the 10th International Writers Festival, India (an International conference of poets, writers and scholars) scheduled for 27-28, December 2014 at Thiruvananthapuram, Kerala. It was all the more fascinating to me as I do not consider myself fit to be called as a poet, writer and/or scholar! Venue was announced as GANDHI BHAVAN, Thiruvananthapuram –the God’s own land, and the theme of the conference was to be Literature and World Peace with special focus on VASUDHAIVA KUTUMBAKAM- all very dear to my heart. Hence I decided to attend the Festival. I love train travel and in fact when I visited TRIVANDRUM (as called in those days) couple of decades ago, I travelled by train-around sixteen hour travel from Chennai and I wrote a 64 line poem in English titled “DELIGHT INDEED IS TRAIN TRAVEL” which was greatly appreciated by the readers. But then my affectionate sons felt that sixteen hour train journey will be taxing their 74 year old father and organized my air travel-to and fro hardly taking 75 minutes by flight! Since it was a couple of years, I visited air port- last was my air travel to Goa to attend the annual convention of the Authors’ Guild Of India” where I submitted a paper on “READING CULTURE IN INDIA” and presented a poem on “WORLD PEACE”-of course both were well received by the scholarly delegates, I agreed with their suggestion of air travel to the festival. Indigo flight took off at Chennai on Friday the 26th December at 16.10 hours and reached Trivandrum at 17.20 hours. Aircraft was full –all the 180 seats occupied. Seated along with me on the right of 18th row were Shri K P Radhakrishnan, a former MLA , Tamilnadu and a Tamil Scholar to attend the Festival and Smt. Ranjani Ranganathan- a student of journalism in Orissa, married in Delhi and hailing from Kerala! In seventy minutes, discussion on varied topics took place! Frills free flight-pay for water or snacks if you need! My sons paid two hundred and fifty rupees in addition to the ticket fares and that fetched me four slices of bread sandwich-tomato, cucumber, lettuce and cheese along with 250 ml of coke! Extra five hundred for both ways!! Though the organizers arranged accommodation who have opted for the same in JAS Hotel and Hotel B G PLaza , nearer to the Festival venue, viz Gandhi Bhavan , Thycaud, Trivandrum, I chose to stay in the Guest House of Life Insurance Corporation of India whose employee was I for a little more than four decades! That beautiful and comfortable Guest House was six kilometers away in Pattom. On that day to nourish, Saturday the December 27th, first day of the Festival, I reached the venue around eight in the morning (though the Conference was scheduled to commence only at 10.30 hrs.) in an auto driven by an honest driver who did not claim a rupee more than the meter rate, rare to come across in my place in these days! Festival poster at the venue. 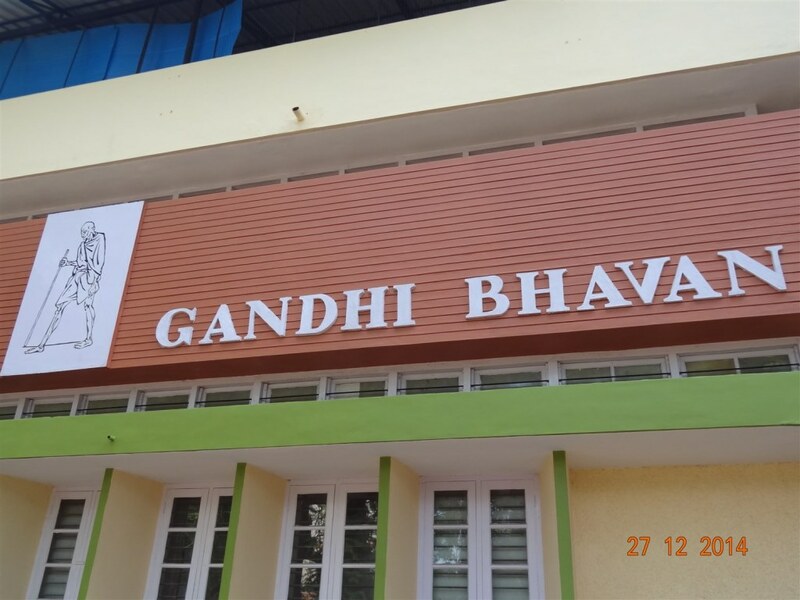 The venue “Gandhi Smarak Nidhi”, Gandhi Bhavan, in Thycaud, Thiruvananthapuram was located in calm and serene location. Though I was there two and a half hours ahead of the schedule, a nice Gandhi an, clad in saffron khadhi dhoti and pyjama, brightly bearded Secretary of the Bhavan Shri K G Jagadeesan received with love and respect. The building was sanctified by great personalities as Dr. Sarvapalli Radhakrishnan, former President of India and Shri Lalbahadur Shastri, former Prime Minister in connection with foundation stone laying ceremony or inauguration of the building. A beautiful burst size statue of Mahatma Gandhi, Father of our Nation blesses us as we enter the main building. 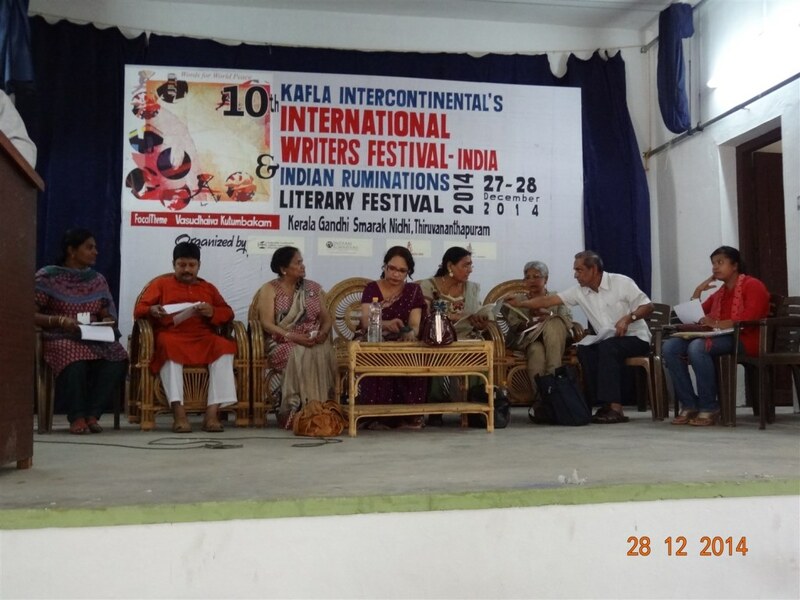 The 10th International Writers’ Festival was organized by India Inter-Continental Cultural Association, Chandigarh. 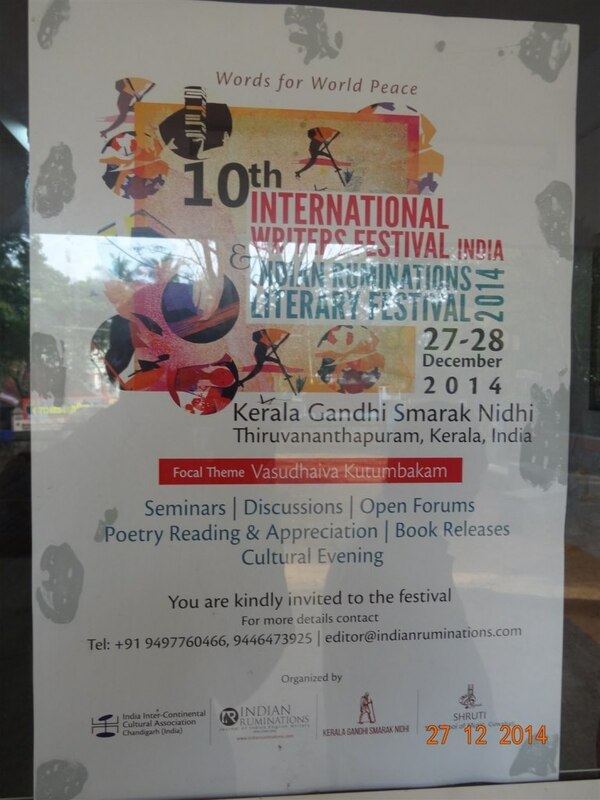 Co-organisers were Indian Ruminations, Thiruvananthapuram, Kerala Gandhi Smaraka Nidhi, Thiruvananthapuram (Kerala) and Shruti-the School of Music, Guwahati (Assam) and supported by Writers Club, Chandigarh and International Poets Society, Nellore (Andhra Pradesh). This was the 10th Festival organized by Kafla International- the first nine were held in Chandigarh (2004), Kurukshetra(2006), Agra(2007), Ambala Cantonment(2008), Jaipur(2009), Chennai((2010), Wardha(2011), Bhubaneswar((2012) and Nellore(2013). This conference was attended by about thirty delegates from the countries like Bangladesh ((9), Croatia ((1), Kazakhstan (1), South Africa (1), Sudan (2), UK (1), USA (1), Uzbekistan (13), Brunei Darussalam(1) and Iran(1). About 96 Indian delegates attended. Andhra Pradesh(3), Assam(1), Bihar(1), Chandigarh(10), Chhattisgarh(3), Gujarat(6), Haryana(2), Jharkhand(2), Karnataka(6), Kerala(15), Madhya Pradesh(3), Maharashtra(4), Meghalaya(1), Mizoram(1), Odisha(2), Puduchery(2), Punjab(6), Rajasthan(1), Tamilnadu((14), Telengana(7), Tripura(1), Uttar Pradesh(2) and West Bengal(3). A beautifully designed booklet was brought out by the organizers providing all the details of the Festival along with the extracts of the papers to be submitted and poems to be presented-indeed a great guide to the delegates. First session of the Festival on 27th was opening Ceremony and Welcome Speeches and release of Books as is usual with such conferences. Shri Dev Bharadwaj, Director, IICCA welcomed the gathering. 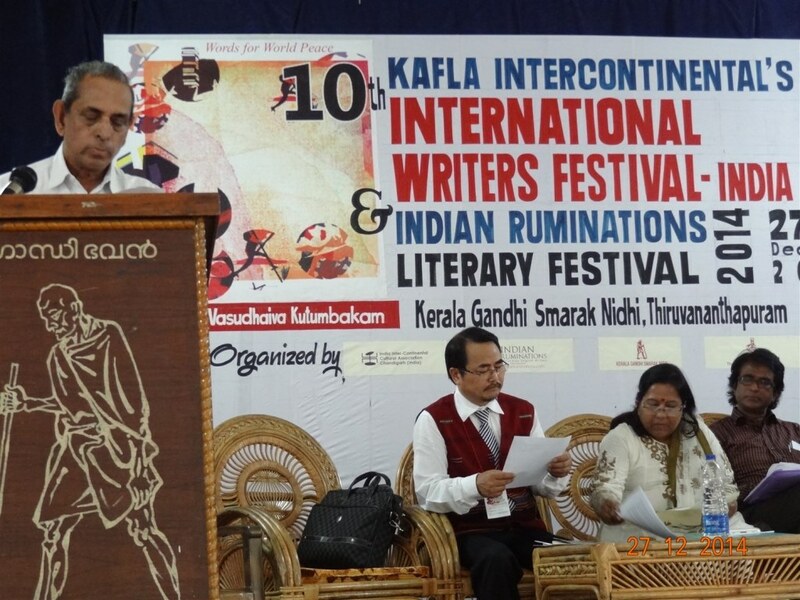 T.Puram: The two day 10th International Literary Meet and the Indian ruminations literary Festival began here on Saturday. 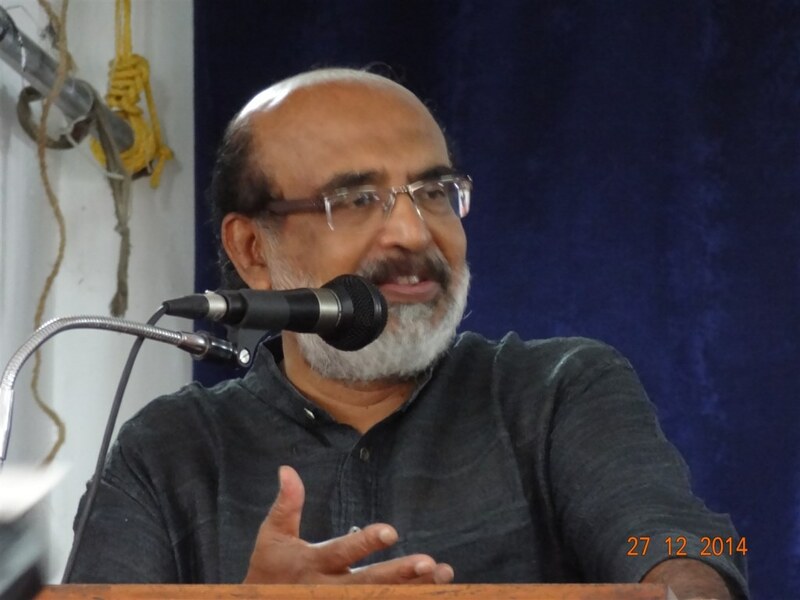 Thomas Isaac MLA, who presided over the inaugural function, called for a radical shift in attitudes so as to facilitate the expansion of cultural activities in the country. “This is very much needed if the future generations are not to abandon art and culture and blindly follow the culture of consumerism,” he added. He said that capitalism would “force to convert” leisure time for promoting production. “Here we have a system that breeds greed. One should strive for a society that promotes sustainable development”, he said. Poet Pudussery Ramachandran inaugurated the meet. He said that Mahatma Gandhi keenly worked for unity of people belonging to different groups. Gandhi Smaraka Nidhi Chairman N. Radhakrishnan, who spoke at the programme, said that the writers have become “change agents” of the society. Writers have the responsibility in molding the future generations, he said. Asror allayarov, a writer and journalist from Uzbekistan, poet Jacob Issac, and Laltluanglina khiangte, who received Padma Shree Award for literature and education in 2006, were also present at the inaugural function of the meet. Dr. N Radhakrishnan, Chairman, Indian Council for Gandhian Studies(New Delhi) Working Chairman Kerala Gandhi Smaraka Nidhi, and Secretary General: Writers Forum for Harmony(New Delhi) addressed and his presidential address of KAFLA INTERCONTINENTAL”S 10th International writers Festival on the theme “THE IDEAL OF VASUDEIVA KUTUMBAKAM in RAJA RAO’S KANTHAPURA and the GREAT INDIAN WAY, distributed to all delegates proves a wonderful reading. After the addresses, a number of new books were released including this writer’s (N V Subbaramana’s) two books- his book of English poems titled “GIFT OF LIFE” translated into Telugu by the poet SRIRAGI, titled “BRATHUKU VARM” was received by PERUGU RAMAKRISHNAN, noted Telugu poet and writer, “THANNIR ALAI” in Tamil translated work of English poems of Japanese poet and the founder of Soka Gokai International, Japan, Daisaku Ikeda by N V Subbaraman was received by Pudussery Ramachandran. In the two days of conference in all 36 papers by the Indian delegates and five papers of delegates from abroad were presented on different subjects keeping the focus on the main theme of the Conferences including my paper on “TRANSLATION LITERATURE”. Most of the papers were in English and a few in Hindi. All the scholarly papers were well received. In all 68 poems in English, Hindi, Malayalam were presented including my 30 line poem in English – “WORLD PEACE- THE NECTAR” and needless to say all were well received. Mr. Thomas Isaac MLA, and former Finance Minister, Kerala delivering address. 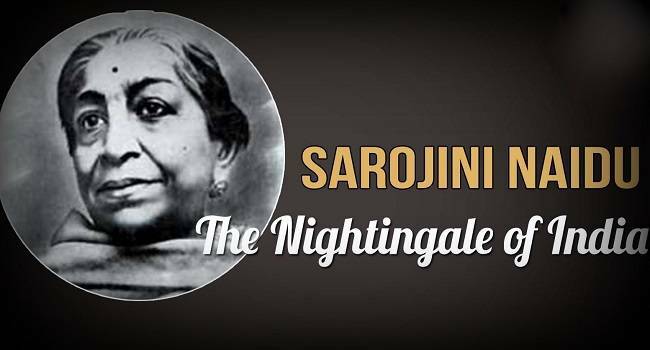 In the evenings, songs were rendered in various languages – Hindi, Guajarati, Assamese, Punjabi and Malayalam proving that some of the poets can be great singers too! On the whole several sessions of Paper submission, poems presentation and singing of songs in the evenings/nights were all well received. 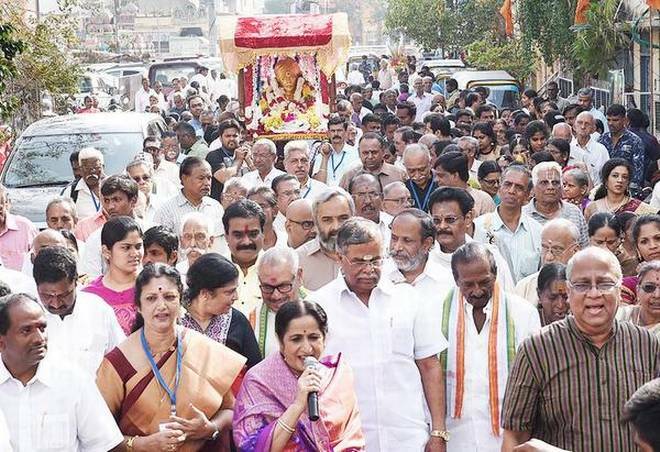 On 27th night there was a candle light procession by the delegates for world peace and harmony and the candles were kept at the feet of Mahatma invoking his blessings and guidance. It was indeed a grand sight to witness! Hospitality in the form of lunch and dinner was excellent. Typical Kerala food-raw rice, boiled rice, chapathi/roti, dhal, poriyal, sambar, rasam, curd, pappad, payasam , aviyal, raitha and so on- served with love and affection, regard and respect- a great experience indeed! Certificates were presented, merit awards were given, and mementos were presented to the organizers by the Kerala delegates. Profuse vote of thanks was proposed by Sandhya and Parinita Goswami. It was announced by Prof. Mustafizur Rahman of Bangladesh that they will be hosting the eleventh International Literary Festival at Dhaka in Bangladesh sometime in September / October 2015. Quite a number of delegates went on a picnic tour to Kanyakumari, Southern most point of India that is Bharath on Monday the 29th December 2014. Organizing such a conference successfully is not an ordinary achievement. Lot of efforts has gone in for days and weeks together to make this festival a memorable one in life time. Patron Mr. Jacob Isaac, a poet of international eminence and author of several books living in Kerala and South Africa and Mr. Perugu Ramakrishna, a poet and convener, International Poets Society, Nellore (AP) made significant contribution for the success of the conference. It is no doubt a team work; yet particular compliments should have to be offered to sarva Shri Dev Bharadwaj Director IICCA, Chandigarh, Sandhya, Managing Editor and the Chief Programme Coordinator, Thiruvananthapuram, KG jagadeesan, Secretary, Gandhi Smaraka Nidhi, Thiruvananthapuram, Prof. J T jayasingh, Chief Editor, Indian Ruminations, and coordinator, and Associates Dr. Babitha Marine Justine, Philipose Thathampally, P L Sreedharan Parokode, Sham Singh and Sathi Balwinder Singh. Yes; with a little more cooperation from the delegates, time could have been better managed. Planting of a sampling in the Gandhi Bhavan in commemoration would have been ideal. With happy memories of the tenth international writers’ Festival, delegates returned to their headquarters with a firm resolve to pursue world peace and harmony, treating the entire world as one family through literary activities. I, N V Subbaraman, am not an exception! Yes; those are the “DAYS TO NOURISH AND THOUGHTS TO CHERISH”! Present Uttar Pradesh.day marks development of women in our Motherland! We celebrate Women’s day today with hands folded in respect! IN AND OUT OF THE NOBLE CIRCLE! Chennai Poets’ Circle is not new to my esteemed viewers as several references have been made earlier in this Blog ENVIUS THOUGHTS in https://nvsr.wordpress.com – an elite group of poets budding and renowned and I must admit it is purely HIS will that I have been a part of this set up for quite a few years. This Sunday story is an attempt to give a fair report on the CPC’s ANNUAL SEMINAR on ENGLISH POETRY IN INDIA nicely organized and well attended by poets from West Bengal, Maharashtra, Gujarat, Karnataka, Kerala, Pondicherry and Tamil Nadu.on 20th January at the World University Service Center in Chetpat, Chennai. Let me share with my viewers with the feedback received by some of the poets who participated in the Seminar on their getting back to their places. Thank you so much for your mail CPC is one of the most looked-forward-to event for me as it so well and seamlessly organized by you and the CPC team, packing in a highly enlightening guest lectures in the inaugural session, illuminating paper readings and truly engaging poetry readings from CPC’s excellently put together annual poetry anthology Efflorescence by poets from across India and overseas! For me, as I keep saying CPC is second home. I truly appreciate your leadership and vision for CPC. The annual seminar is an exclusive event that focuses on poetry alone and avoids unnecessary frills. The event was well organised. Kudos to all your efforts. Hema, Jairam, Dr. Tirumeni, and rest of CPC core members. May your tribe increase. Thank you all, Dr Tirumeni Sir, Hema, Jairam and you Dr Kannan Sir and Team CPC, for providing a memorable and poetically enriching experience every year! What I truly loved about today’s meet was the genuineness of the platform. It was authentic poetry in all its humility and grace. My husband and I feel so privileged to have been a part of it. Thank you for giving both of us the opportunity. Please find below the google drive link to download the photos of the CPC meet held on 20-01-2019 at WUSC, Chennai. Mr.Shankar has done a highly commendable and selfless service in covering the entire proceedings of the Seminar. He took countless photos with a smiling face and cheerful gentleness. Our grateful thanks are due to him. We at CPC are very much delighted to see both of you so much involved and dedicated towards the cause of Poetry . As you rightly mentioned the function yesterday was truly a remarkable national event of which all of us can be really proud of. I liked your significant remark about presentation of more papers as was done in earlier years. I am sure in future, a great deal of thought would be given to this aspect.This would really set us apart . I went back with happy memories of the event. Thank you and all in the team who made it happen. It was a fruitful experience, taking part in the CPC event, and meeting many beautiful creative minds. Felt very happy, and blessed to be a part of it. Much grateful to you, Jairam Seshadri Sir, Hema Ravi Ma’m, and to the entire team for organising and making this event a memorable one for all. Being my first time at the CPC event, felt very happy to meet so many poets; inspired by the Kaleidoscope of thoughts and emotions flowing through words from each one of them. The chief guests’ speech too were interesting, and thought-provoking. Chennai: Age is no bar for creativity: You would not think this is a tired cliche if you had attended the annual seminar of Chennai Poets’ Circle (CPC) on Sunday, 20 January, at the World University Service Centre, Chetpet. The highlight of this year’s seminar was the contribution of poets aged 11 years to 87 years. The CPC is a non-profit, non-sectarian, literary body of academicians, professionals, students and homemakers interested in poetry writing in English, and sharing such creativity with like-minded personalities; over the years, the CPC has spread its wings nationally and internationally. The local members of CPC meet once a month to recite and discuss poetic views. At the annual seminar, distinguished guest speakers share their views on poetry, member-poets present academic papers on Indian English writing and recite their poems in front of a distinguished gathering of poets, special invitees and the public. Amateur guest poets are encouraged to recite their poems. During the seminar on Sunday, the anthology ‘Efflorescence 2018’, a collection of poems written by its members, was released. The chief guest on the occasion was Dr C N Srinath, director, Dhvanyaloka Centre for Indian Studies, Mysuru, and the guest of honour was Dr V Rajagopalan, retired HOD, English, MCC College, Chennai. Dr Thirumeni, chairman, welcomed the gathering, and Dr Kannan traced the achievements of the CPC in the last few years. Hema Ravi, secretary, anchored the poetry reading session in the forenoon, while Jairam Seshadri compered the proceedings in the afternoon session. The paper presentations were chaired by Dr T V Reddy, Dr Biplab Chakraborty and Dr Kannan. Sharing their erudition with the audience, the speakers spoke about the contribution of great poets, emphasising that the poet is a ‘seer’ and poetry is the encounter with the impossible. Quoting a renowned poet, one of the speakers said, “Like a piece of ice on a hot stove, the poem must ride on its own melting.” The role of poets in ‘digital detoxification’ was also stressed upon. The highlight of this year’s seminar was the contribution of poets aged 11 years to 87 years and paper presentations by academicians from Sastra University. Eminent writer, poet and media personality, Andal Priyadarshini, who has been awarded the Kalaimamani award by the Tamilnadu government, was among the audience as a contributing poet. Poets had come from Tirupati, Hyderabad, Kochi, Kolkata, Mumbai, Bengaluru, Puducherry and Tiruchi. Two budding poets, aged seven and ten, wards of member-poets recited their verses confidently in front of the gathering. For details, contact secretary, Hema Ravi, at 9841003201. I am sure my esteemed viewers have received a fairly a good report on the event. The said Anthology carries the following Poems by me and Miss. S Nivetha one of the EIGHT young poets who contributed their creations to the Anthology. 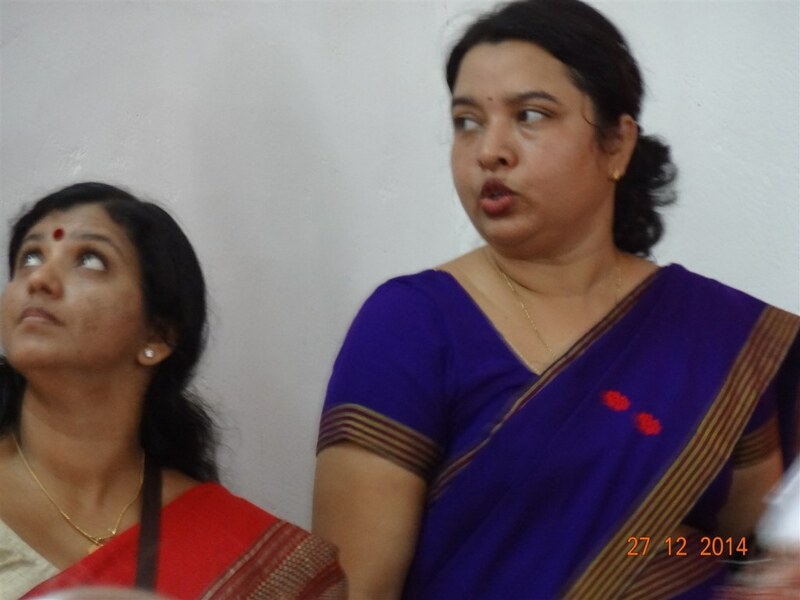 Dr. V. Rajagopalan, Guest of Honor who was the Principal and Head of the English Department quoted a few lines from the Book FLY,FLY,FLY published by S > NIVETHA (released in the last Seminar in 2018) and commended the imagination and expression of the young poet and wished her every success. Heartily I pray for its noble service-dome! Influenced me a lot in my thoughts and words! Several great minds and hearts are there to help and guide! Every month which I am not able to avail. Young ones can learn a lot from the experienced. Yearly once the Anthology blossoms bright! Ever increasing thirst I have for poetry! An acrostic poem –“CHENNAI POETS’ CIRCLE –MY LITERARY HOME”. Vijayawada on 13 and14th November in 2016 and again the youngest delegate inthe Annual Poetry Seminar organized by Chennai Poets’ Circle in January 2017. She is well anthologized. She writes prose and verse, a good painter and cartoonist. Nivetha finds a place of pride in the INDIAN BOOK OF RECORDS FOR CHILDREN for having participated in the Vijayawada Meet as the youngest poet. To whom the noble throng! No woes the life brings! Freed from the sins nice! In this world – pure! Never free from worry’s woes! Have eyes and ears just dot(s)! Others don’t – face woes! These ten couplets are my translation of the Magnum Opus Thirukkural by Thiruvalluvar written about 2000 years ago in Tamil into English. The chapter 1 of the 133, speaks about the Glory of God. N V Subbaraman, a bilingual poet is the Asia -Pacific Book of Records holder for his Blog ENVIUS THOUGHTS n https://nvsr.wordpress.com. He has participated in many poetry festivals of which he holds International Multilingual Poets Meet held in November 2016 at Vijayawada and the Seminar organized by Chennai Poet’s Circle in January 2018 high in his mind. He is a haikuist with more than 1000 haiku to his credit and he is a Member of the American Haiku Society. He has published 38 books in English and Tamil. He is retired Deputy Zonal Manager of Life insurance Corporation of India. Indeed the day was a very memorable one for all the poets present in the Seminar. Dr.C. Thirumeni, Chairman of CPS extended a very warm welcome which was very chill outside due to mid-winter season, Dr.S.Kannan President of CPC, delivered his Presidential Address, followed by the launch of the Anthology by Dr. Prof. C N Srinath, Chairman, Bhavanyaloka Center for Indian Studies, Mysore..Dr. V.Rajagopalan addressed the gathering of Poets. Annual Report was presented by Shri Jairam Seshadri, Treasurer. Poetry presentation first session started. After delicious lunch, poetry session continued and two papers were presented by two academicians. Vote of thanks was proposed by Mrs.Hema Ravi. After National Anthem, poet delegates returned carrying the great memories “IN AND OUT OF THE NOBLE CIRCLE”. Thus we end our this week’s Sunday story and the week to follow as usual. Till then GOOD BYE! All over the world-in all languages-mighty force made by the Lord! Rumi, Yeats, Dante, Milton, Shakespeare, Shelly,Keats and all pure! The greatest-national-patriotic-king of poets was born this day Eleventh December eighteen eighty two-a holy day! On this sacred day we pay our obeisance to the KING OF POETS! JATHI PALLAKKU-Bharathi Palanquin coming in a procession. 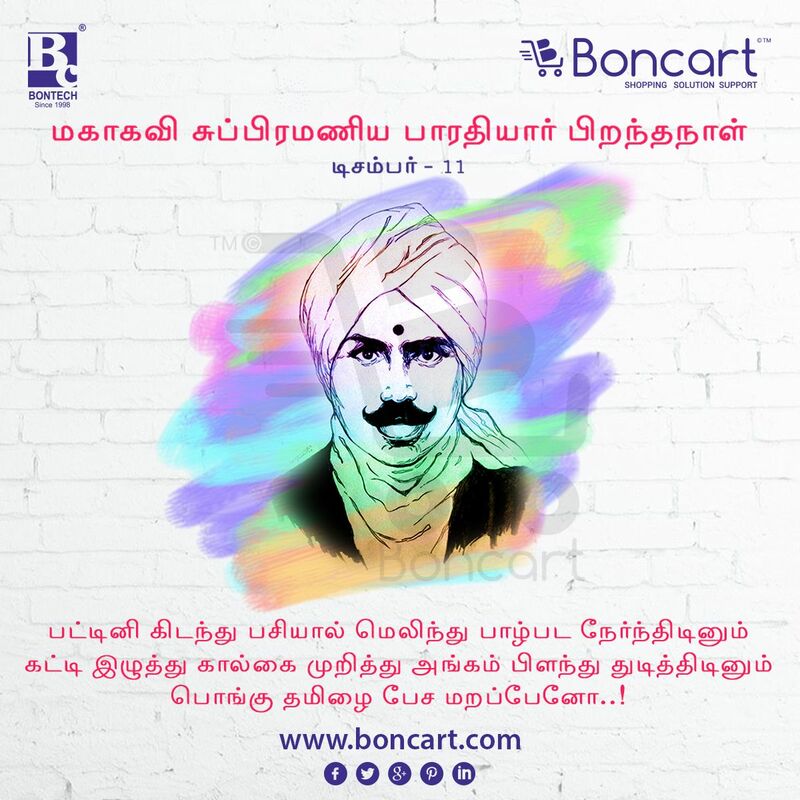 With Bharthiyar’s -my mentor from his heavenly abode-grace and blessings, my poem in Tamil has been selected by Vanavil Cultural Center to be presented in a poets Meet being held at Barathiyar’s Memorial in Triplicane Chennai today at 10 am after the JATHI PALLAKKU-Palanquin with Bharathi’s portrait-reaches from Triplicane Parthasarathy temple . As if to prove the oft quoted statement that “Art and Literature of the highest type cannot flourish in a society which is increasingly becoming mechanical and the society a rocket” the literary couple Associate Professors of English r Dr.Prof. 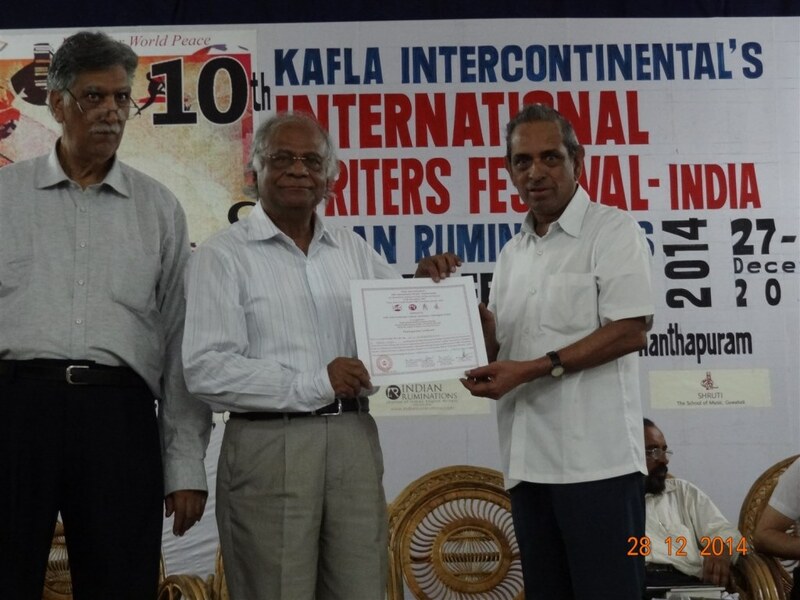 K Gopichand and Dr. Prof Nagasuseela of JKC College, Guntur, Andhra Pradesh have been celebrating the “GUNTUR INTERNATIONAL POETRY FESTIVAL” very successfully for the last “ELEVEN LONG Years without break. For me and Nivetha, it all started with their invitation through their website for contributing our poems for their proposed Anthology titled “TRANQUIL MUSE” during the Poetry festival in September 2018! We submitted our English poems and the things moved very fast with three page long detailed instructions reading as-just to show how meticulous they are in organizing! Welcome to the Eleventh International Poetry Festival. along with your working mobile numbers. * Those who can’t make out for the Fest , Please mail us your postal address. So that we’ll send you the Anthology soon after the Fest. There’ll be a Book Release ceremony at the Inaugural function. Those who would like to release their CREATIVE/ CRITICAL BOOKS /CDs /Posters etc along with the Anthology “Tranquil Muse” may bring the 5 copies and have your books / CDs released before a galaxy of Internationally reputed Poets & Creative Writers. They are requested to submit a copy to the Organizers, so that they’ll treasure it in the college library. Kindly let us know of your participation in the Book release session. The Title, The Publisher and a Brief note about the Book/CD/Poster in 5 lines. Also let us know… if there’re any changes in your arrival & departure timings. 1.Straight away read the poem when you’re invited on to the dais. 2.You are advised to render your poem with feeling & meaning to the audience. 3.Kindly see that your voice is loud and clear. 5.Live Program me in FB will be given; Later the video is uploaded into you-tube. 6.There’ll be around 500 audience in the Auditorium. 7.Every Poet is felicitated according to our tradition. 8.Certificates will be issued to all the participants. Poets should write a message for Peace on the Canvas that is fixed at the garden. v Thank you for your Cooperation and Contribution. There will be a Day and Night Poetry Rendering from 7.00pm to 12.00 Midnight in the vernacular languages. Poets who compose poems other than English language are requested to bring a few poems along with them, for recitation during the Night session. Poets are advised to explain the theme of the poem briefly before rendering it in their Mother Tongue. Dance, Song, Dialogue etc may be performed for the poets before dinner time. Poets are advised to bring their Traditional Costume …So that they can wear it on the first day. 1.You can have extra copies of the Anthology “Tranquil Muse“ at the venue. Previous Fest Anthologies, 2008 to 2018 , (1. Heart –Throbs, 2.A Posy of Poesy, 3. Poets’ Paradise, 4. The Fancy Realms, 5. The Poetic Bliss, 6. The Enchanted World, 7. The Rainbow Hues, 8. Happy Isle 9. Chants of Peace10. Symphony of Peace, (Each Book is Available @ Rs 150/- Symphony of Peace is Rs 200/-) are available. Posters on Rakhi, Ragging, Teachers Day, Positive thinking, Life, AIDS, Pollution, Friendship, Festivals, Floods, etc …and post cards are available for sale. Kindly strengthen us by buying these works of art & literature. The amount collected is utilized for conducting the Future Poetry Fests. With a desire to serve nation. Ø Let us together make the Fest a Grand Success. # Have a nice and safeJourney. Eagerly waiting to meet you all. Days rolled down fast and September 20th came and we boarded the Chennai -Vijayawada Shadapti Express and we were at Guntur by 13.30 hrs to be warmly received by the Organizers and we were guided to a nice Hotel NANDURI RESIDENCY in Arundalepet. About five hundred poets from more than 50 countries attended the Festival. Near the hillock and make me proud! Green lush lawn a treat to see! Through the WINGS OF POETRY! Thanking you for all they grace! What world sees is only struggle. Lost his life for peace! Lost HIS life at the devil’s CROSS! Have we listened to his views and voice? Gandhi was shot to death! He practiced walk towards love! Peace we hold and lead our lives. Even sacrificing all, let us protect peace! From all over the world reading the Festival notes! On the pressures we exert on the powers itching with ease! In times of peace world plans for war! All that leaves when the peace is in! And keeps the forces at bay that divided! Lo! Paradox of war and peace! Seeking superiority with deadly hold! Bringing rain of joy and plenty ll with ease! Welcome to the mysteries of the future! Endless love and deathless humanism! Poetic disposition and and peaceful possession! All we have to work with mirth! Incidentally I was the only poet to have presented poems in three languages viz Telugu, Tamil and English! Like that of the fast, moving fan. The distance of those miles never ends. Seen in all shapes and colors of kinds! That flows through Niagara falls. For us to keep all our lives quite pure! All the delegates were accommodated in different Hotels, Guest Houses, rest houses and fine arrangements were made to bring them on time to the Venue viz Jagarimudi Lakshmiah Choudary Auditorium, JKC College, Guntur. A spacious A/c Auditorium. Detailed program was gone through all the days of the Festival for the Eleventh Year! College Management consisting of Dr. K. Basavapunniah, Former President NES, Shri J Murali Mohan, Secretary and Correspondent JKCC, Dr. I Nageswara Rao, Principal, JKC, Sri SRK Prasad Director PG courses attended the days and played their roles nicely. Peace rally awakened the public. Peace cards were released and distributed to the delegates.